POVERTY AMONG WORKING lone parents has more than doubled between 2012 and 2017, according to a new report by the Society of St Vincent de Paul (SVP). The report – Working, Parenting and Struggling – found that in 2012 one in 11 working lone parents were living below the poverty line, but by 2017 it had increased to one in five. It found that the living standard of lone parents in Ireland are among the worst in Europe as they have the second highest rates of income poverty, persistent poverty and severe deprivation among 15 EU peer countries. 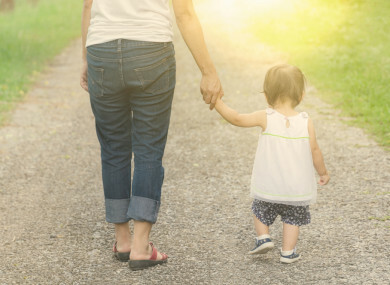 “High housing and childcare costs combined with low levels of income mean that it is very difficult for many families with children to make ends meet,” SVP social policy development officer and author of the report Dr Tricia Keilthy said. In 2017, 45% of lone parents reported a heavy financial burden due to housing costs and almost 18% were in arrears on mortgage or rent repayments. The rate of arrears for other households with children was 8% in 2017. The report also found that in 2017, 84% of lone parents in Ireland were unable to meet unexpected expenses, compared to an EU-15 average of 58%. In 2017, 58% of lone parents were working compared to 46% in 2012. This is the lowest rate among the 15 EU countries. However, the rate increases to 66% for those with children over 12, indicating that when childcare needs are lower, the labour market attachment of lone parent is higher. Almost 60% of lone parents reported that they couldn’t access childcare services due to cost – the second highest rate in the 15 EU countries, just after Spain. Employment rates are three times higher among lone parents with third level education but one in five lone parents reported that they couldn’t access formal education for financial reasons. “The first SVP members began their work in Dublin in 1844. However, many of the same issues of poverty – low paid, precarious work and poor quality housing – persist for the people we assist,” SVP national president Kieran Stafford said. “Our members see the strain on working lone parents who are trying to combine spending time with their children and meeting their caring responsibilities with jobs which can be inflexible and insecure, and often do not provide a sufficient income to meet all of the household needs”. Email “Poverty has doubled among working parents over five-year period, SVP report finds”. Feedback on “Poverty has doubled among working parents over five-year period, SVP report finds”.